Do you like dancing outdoors to awesome music? 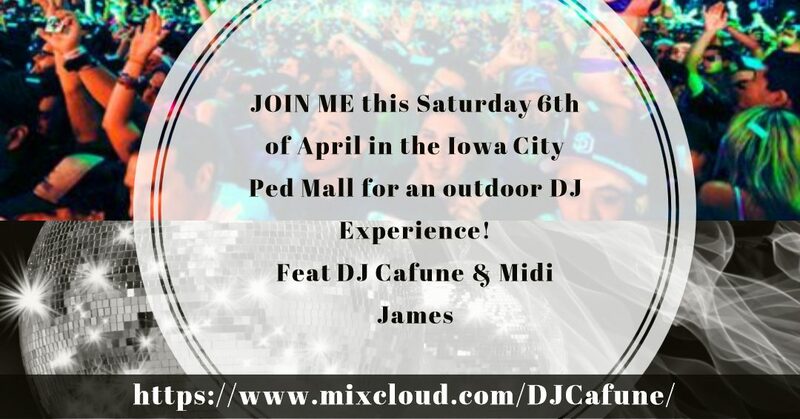 Well come down to the Pedestrian Mall in Iowa City on Saturday the 6th of April and experience a unique pop-up outdoor dance party experience!! DJs Cafune and Midi James both spin unique styles of house music and dance. Popular music will also be part of the mix and there may be opportuntity for requests. We also have a special guest that should be joining us in the afternoon! Cafune is a Chicago House DJ that enjoys any music that gets bodies moving. He fuses together deep and upbeat Chicago House music along with popular music to fuse a powerful dance floor experience that motivates the soul and the feet. Midi James has DJ’d for ecstatic dance and carries a wide variety of musically delectable tunes with him at all times. He seamlessly switches from deep house to indian dance without missing a beat. You WILL NOT want to miss this experience so come on down we will be playing all afternoon to about 6pm to appease the masses!